For any small business, the thought of being paper-free is cathartic. Making the transition isn’t easy, but with a thoughtful, disciplined approach, it can be done. And, oh how sweet it is once you’re free of those piles of paper. Before jumping in too deep, let's discuss the steps you should take to lay a strong, paperless foundation. If executed correctly this foundation will support you for years to come. Going paperless is a process, and just like quitting smoking, it’s tough to quit paper cold turkey. We recommend starting small. Take stock of all your paper-based processes. Pinpoint the one you think you can digitize with the least amount of effort. This will allow you to build the habit. Office receipts and bills are a great place to start. Document how you're currently receiving the paper documents (mail, from an employee, etc). Once you know where they're coming from, start thinking of ways to digitize the process. It's important to pick a process that isn't too big, and that you can tackle confidently. Once you know where you're going to eliminate paper first, you should start thinking about what software you're going to use to help make it happen. There are many free tools to help digitize paper-based processes, including the camera on your mobile device, email, cloud storage platforms, and so on. With that said, it's easy to outgrow these tools once you start tackling more than one process at a time. Digitizing 20 financial documents a month can quickly grow to hundreds. When selecting software to help your office go paperless, it's important to pick apps that will scale with your business. Financial document management software has come a long way. 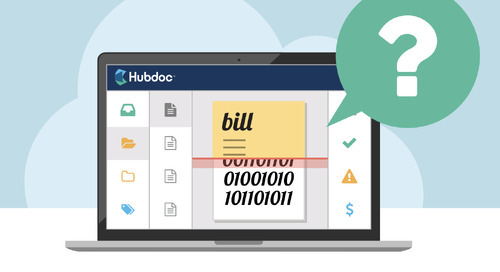 Apps like Hubdoc can auto-fetch financial documents from over 700 banks, utilities, telecom providers and online suppliers; extract the key data (supplier name, date, and total amount); and publish to cloud accounting software like QuickBooks Online and Xero for one-click reconciliation and audit-proofing. Apps like Hubdoc help save you and your accounting team a ton of time. If you're working with an accounting or bookkeeping firm, ask for their advice. They work with a lot of clients that have successfully made the shift to a paperless office. More likely than not, they'll be able to suggest the right apps to suit your business needs. Here are a few tips to help with software selection. Does the app replace or improve an existing process? e.g. "We receive the office Internet bill by mail, but with tools like Hubdoc, the bill is automatically fetched, processed and organized." Does your accounting system endorse the app? e.g. "We use QuickBooks Online to do our bookkeeping. Does the app we're considering for document management integrate with QuickBooks Online?" What do existing users say about the app? Do they have excellent technical support? How will the app scale with my business needs? e.g. "Right now, I'm making one process paperless, but eventually, my whole office will be paperless. Will the app support thousands of paper documents on a monthly basis?" Now that you’re nailing your first paperless process, it’s time to get your team on board. The best way to do this is to add a second process that involves one or two of your co-workers. Keeping the first test group small gives you more control over the experience. And if the first group has a positive experience, it will help build interest from colleagues not yet involved. Once you’ve selected your team, and the process you’re going to tackle, take 15 minutes to walk them through your beautifully-designed paperless process. This should include a brief overview of "the old way of doing things", the new workflow, and the software you’re using. With this information, your team will understand the who, what, where, when, why, and how, ensuring paperless success. At this point, you’ve successfully transitioned two paper-based processes to paperless workflows. Now, it’s time to rinse and repeat until you’re running a completely paperless office! Make sure to keep your accounting and bookkeeping team involved. They might have tips about how you can make it more effective and will make sure you’re following IRS or CRA rules. Last but not least, stay disciplined. Keep a calendar in your office checking off each day that you’ve stayed paperless. This will help reinforce positive behaviors. It also wouldn’t hurt to throw your team a pizza party (or something equivalent!) to celebrate 30 days of a paper-free environment. Thanks for reading through the steps and preparing yourself for your new paperless (and stress-free!) office. Enjoy it, and please let us know if you discovered anything along the way that made the transition easier! Are you a bookkeeper, or in charge of bookkeeping for your business? Start your paperless journey today. Watch our free webinar to learn how to automate document collection! 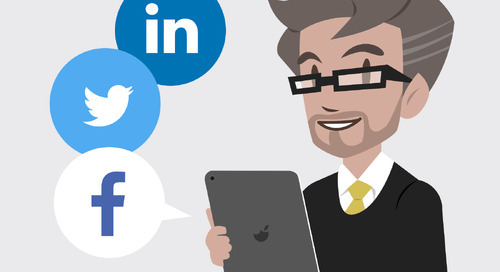 Learn how to market an accounting firm like a pro with these 8 tips!